The picture below depicts the events that lead to insulin secretion from pancreatic beta cells. To begin, glucose is transported into the beta cell. As a result of glucose metabolism, ATP molecules are generated. 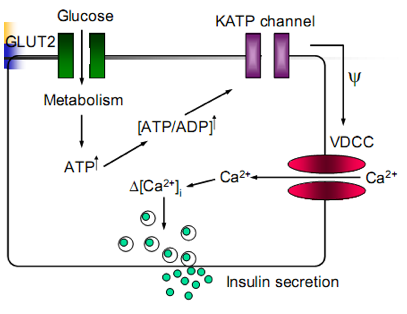 An increased level of ATP inhibits the KATP channel, preventing entrance of K+ ions into the cell. The consequence of this action is depolarization of the cell membrane and subsequent activation of the VDCC. Ca2+ ions enter into the cell stimulating exocytosis of insulin. This is a great example of an application question in the biology section of the DAT.